On this page you can download and print birthday crowns, cards for student birthdays, and birthday timelines to decorate your classroom walls. Here's a colorful hat that your birthday student can wear on his or her special day. We recommend you print this on heavy card stock. If you'd like your students to decorate their own hat, try this black-and-white version. Students can color it in before they assemble it. For best results, print on card stock. This color crown says, "I'm 3!" Cut it out, tape it together, and it's ready-to-wear. Print on card stock for best results. Another version of the 3-year-old birthday headband. This one os black and white so your birthday student and his friends can color it in themselves. Here's a full color version of the 4-year-old birthday celebration hat. Don't forget to use card stock when you print this file. Kids will surely enjoy coloring this festive birthday crown. Color, cut, assemble, and wear. Teachers can print this full color 5-year-old hat to celebrate the a student birthday. Don't forget to put card stock in your printer when you use this file. Five-year-olds will love to celebrate their birthday with this awesome headband! This B&W file can be colored in by students. Click here to see the color version of the b-day crown for 6-year-olds. This is the B&W crown for a six-year-old. Kids can color it in, assemble, and wear it around the school proudly. 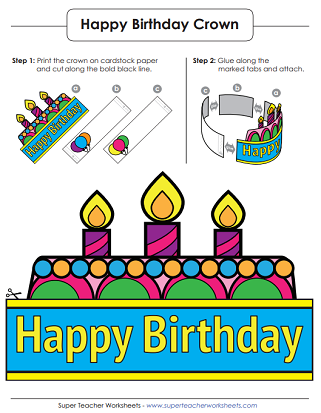 Download and print this full color birthday hat for a 7-year-old. Don't forget to put a couple sheets of card stock in your printer when you use this file. This cute b-day hat for a 7-year-old can be colored with crayons, assembled with glue, and then worn around the school. Here are some fun "Happy Birthday" wristbands that your kids can color and wear on their birthdays. Teachers can print this colorful birthday card for their students. There's a picture of a sea turtle. The inside reads, "I hope your day is turtle-ly awesome!" Here's a black and white version of the "turtle-ly awesome" card mentioned above. Students can color in this card themselves. Your kids can make a colorful birthday timeline that hangs across your classroom. 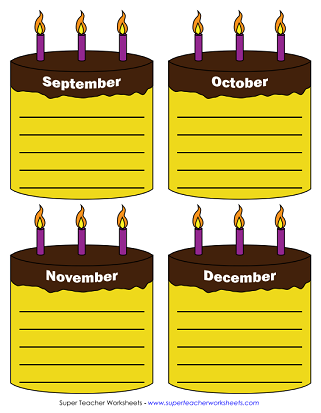 Write the dates of students birthdays on this birthday cake poster. The illustrations are black and white so kids can color them in. This colorful birthday poster/chart can hang in your classroom. Just print it out and add the dates of student birthdays. This birthday chart has picture of balloons. Color it in, add dates, and hang it up in your classroom. This is a color version of the balloon birthday calendar. Printable blank calendars for each month of the year.